I remember watching you on an interview after Prime Minister Netanyahu addressed Congress and even then I was struck by the arrogant attitude you displayed towards the Israeli Head of State. With that in mind your recent statements come as no shock to me despite the incredulous lack of logic in your words. First of all, you say the Iranians are “sincere” about wanting a deal. Well thank you Captain Obvious. Of course they want a deal. This is the best thing that could have happened to them. They get everything they want. A lifting of sanctions, a place on the world stage, and a nuclear program that could very well wind up making them the most dangerous nation on earth. It doesn’t take a brain surgeon or even a Senator from California to realize that Iran would be happy with this arrangement. So to say that they are sincere about wanting a deal, is nothing less than a waste of breath. You then go on to say that you disagree that “the broad outlines of the deal threaten the survival of Israel”. If this deal increases the likelihood of Iran getting nuclear weapons that statement is just ludicrous. Iran has repeatedly stated that it wants to wipe Israel off the planet. Therefore basic logic would dictate that an Iran with nuclear weapons would indeed be a threat to Israel’s survival. Personally I am offended by anyone, particularly a Jewish leader speaking so disrespectfully about the Prime Minister of Israel, but I guess you are so partisan in your policies that you believe it is important to speak of him this way in order to support President Obama. As far as the crux of the statement is concerned, if someone speaks out against someone’s desire to commit suicide but doesn’t give the individual an alternative way to live their life, should they therefore be in favor of suicide? Based on your statement suicide would be the right move, not just for the individual in this hypothetical scenario, but based on this policy, for the United States as well. Of course you are opposed to this because you are seeing through partisan blinders and they are causing you to support the president in a deal with a distrustful government with the ambition of radicalizing the entire planet. Your own statement in response to Netanyahu’s comment only shows how illogical dealing with Iran is when you say, that the path of sanctions would drive Iran’s program underground and make it more difficult to monitor. How do you get from that to believing this is a legitimate partner in peace? I don’t believe that you do. Instead I believe you are playing partisan politics at its worst, even when it is detrimental to the safety of the State of Israel, the United States of America, and ultimately the entire western world. To me this is poor and irresponsible leadership that will not only hurt the country, but the political party you clearly deem more important than anything else. Not to mention the fact that as a Jew, it is my opinion, and one shared by many others, that in supporting this deal you are supporting a policy that puts the Jewish nation and Jews everywhere in danger. I hope you can live with that. 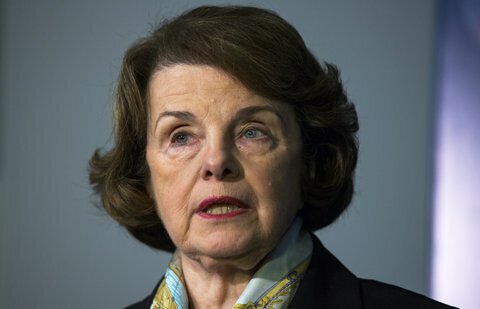 This entry was posted on Thursday, May 7th, 2015 at 9:20 pm	and tagged with Benjamin Netanyahu, Dianne Feinstein, Iranian nuclear deal, Israel, Jewish, President Obama, United States of America and posted in Uncategorized. You can follow any responses to this entry through the RSS 2.0 feed.